Orange and Barclaycard have revealed that the Samsung Galaxy S3 has been the first Android phone chosen to get QuickTap functionality. QuickTap is the contactless payment system conjured up by Barclays, and, using NFC, that offers users a way to pay for goods without having to punch in their pin numbers. All you need to do is find a QuickTap enabled shop and, well, give the payment machine a quick tap and payment is achieved. Yes, it's not really contactless – you actually have to tap the machine – but that's the term coined for such a service and who are we to argue? QuickTap is already on a number of phones, such as the Tocco and Wave 578, but there's been something of a wait for an Android phone to come bearing QuickTap gifts. Orange exclusively told TechRadar back in July, though, that something would appear soon and the company has stayed true to its word. 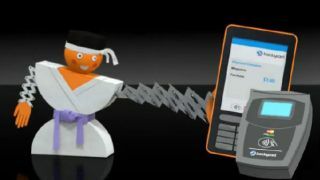 Although Barclaycard is now offering its service to Samsung galaxy S3 customers, not everyone can join the QuickTap club. You have to also be on the Orange network for the service to work, and you have to have gotten your phone from 5 September. Oh, and you need to have a UK MasterCard or Visa card as well. We're guessing Orange will be bringing this feature to phones bought before this date but there's no news on when this is happening. To rub salt in the wounds of those who went elsewhere for their S3, Barclays is offering Orange S3 customers who sign up to the service between 5 September and 5 October of this year £50 credit to spend using their phone. Currently 100,000 locations support QuickTap – including the likes of McDonalds, M&S, Co-op Food, Prêt a Manger and EAT. Although, from our experience, you may have to tell the shops that they actually have the technology installed before you start waving your phone at them, telling them that you no longer need money as your phone can perform QuickTap magic. For more information, head over to www.orange.co.uk/quicktap.